To toggle a PC breakpoint, double click an instruction in the command viewer. To add a memory breakpoint, right click bytes in the memory viewer or press the + button next to the breakpoint list in the command viewer. If you have any bug reports, questions or suggestions, feel free to post them! I also went ahead and fixed PJ64's settings window for Wine, so Linux users shouldn't need to manually edit the config file anymore. The development build section on PJ64's website was made public (https://www.pj64-emu.com/nightly-builds), so I'm no longer uploading github releases to my personal fork. When "Enable CPU Logging" is checked, the PC, opcode, and GP/FP register states are pushed to a list at the start of every CPU step. Setting "Buffer size" sets the maximum number of states it's allowed to log before it starts tossing out old states. Double-clicking an entry in the list brings up the PC address in the command viewer. I also made it so that when there is a CPU-related error, instead of just showing a nondescript error message and quitting, PJ64 will now pause and show the commands window at the exception vector, so the COP0 registers can be checked for the cause of the error. For most games you can check everything except interrupt and coprocessor unusable (and watchpoint? may be a bug). 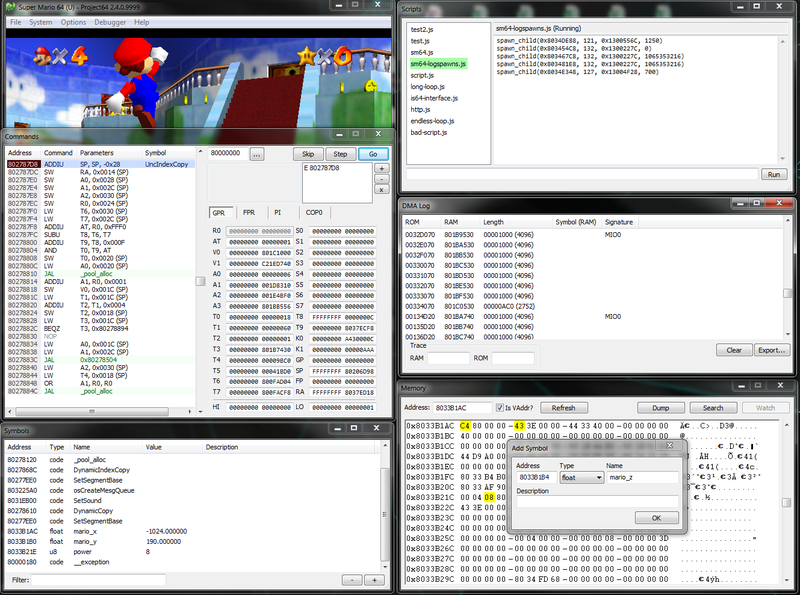 Some games which use TLB exceptions to their advantage may need the TLB-related codes unchecked. Watchlist data is saved/loaded automatically per game.